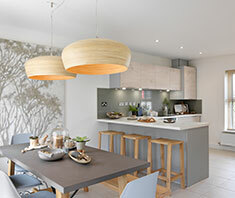 Our show homes are designed to inspire you, with our interior designers travelling the world in search of trends and inspiration to create the stunning show home designs you see at our developments. The Emerald, a four bedroom family home, is the latest addition to our collection of show homes and can be found at our Attraction development in Hull. Here’s how you can recreate the styles you see in the Emerald in your own family home. Neutral and soothing tones flow throughout the Emerald show home, and the kitchen is no exception. White gloss doors in the kitchen reflect the light from the deep kitchen window and create an airy, spacious feel, while wooden worktops create a contrast and bring a touch of nature to the space. 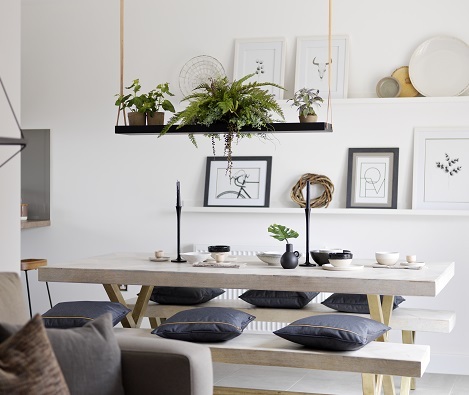 From the kitchen to the dining room, the natural theme continues, bringing the outside in with a statement shelf with hanging plants. You can also add personality to a large, white space with picture shelves like the ones behind the dining table. Display wall art that reflects your family’s likes and interests and add colour to the space with crockery or colourful imagery. 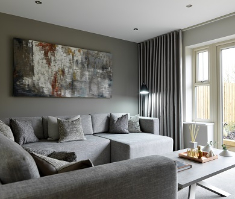 In the lounge, tonal shades of cream and grey make the space feel airy and spacious. A huge sofa with lots of cushions is both stylish and comfortable – perfect for a family to curl up on. Create extra seating for guests and make a statement with armchairs or rocking chairs. 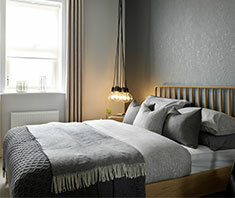 In the bedrooms, you can create a welcoming atmosphere with soft, pooled lighting and soothing shades. Chunky knits and linen fabrics in neutral tones create tranquillity in all bedrooms in the Emerald, while statement artwork create emotion and movement in each room. And when it comes to the children’s bedrooms, we’ve let our imaginations flow. The nature theme continues with the woodland wallpaper, and the cosy den makes bedtime so much fun.